I walked out of the subway this morning and found myself walking toward a food truck bearing the sign “healthy comfort food.” I’m always intrigued by anyone claiming to sell “healthy” foods, but most of the time, their idea of “healthy” falls quite a bit below my standards! 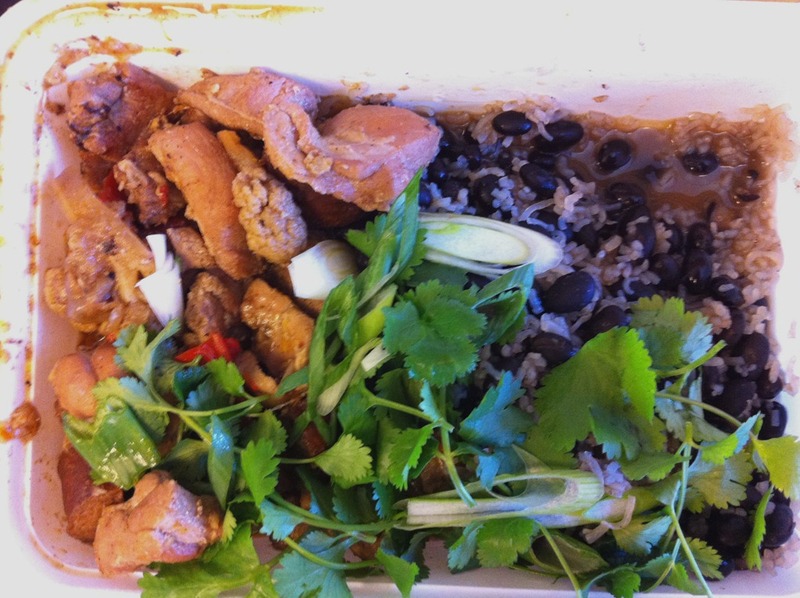 However, I am happy to say,the Now Eat This food truck is not only tasty but also reasonably healthy. That said, I do wish they would tell you the carb count along with the rest of the nutritional information. MENU: The primary aim of their menu appears to be low calorie food with an emphasis on gluten free and sugar free. For example, you can get gluten free meatballs with penne pasta (349 calories), faux fried General Tso’s chicken (310 calories), or a cheesy turkey black bean enchilada with low carb tortilla (302 calories). In addition, they also have one low carb option, which I went for: chicken & andouille jambalaya with no carb Shirataki rice (they do add black beans, which have carbs). This dish is pictured below. The meat was pretty decent quality and the sauce was tasty (with just a bit of spice). I was a bit worried about the Shirataki rice, but it actually tasted pretty good and soaked up the flavors well. 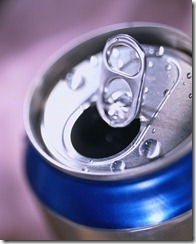 DRINKS: They sell only zero-calorie drinks, including iced tea, Zevia, and other calorie-free sodas. 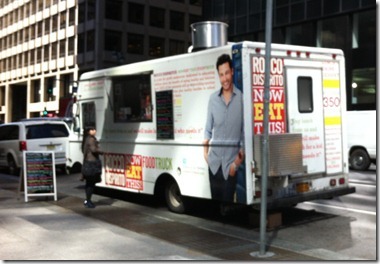 THE STORY: The food truck was started by celebrity chef Rocco DiSpirito (and I assume that’s his picture plastered across the truck). They also sell his cook book at the truck! 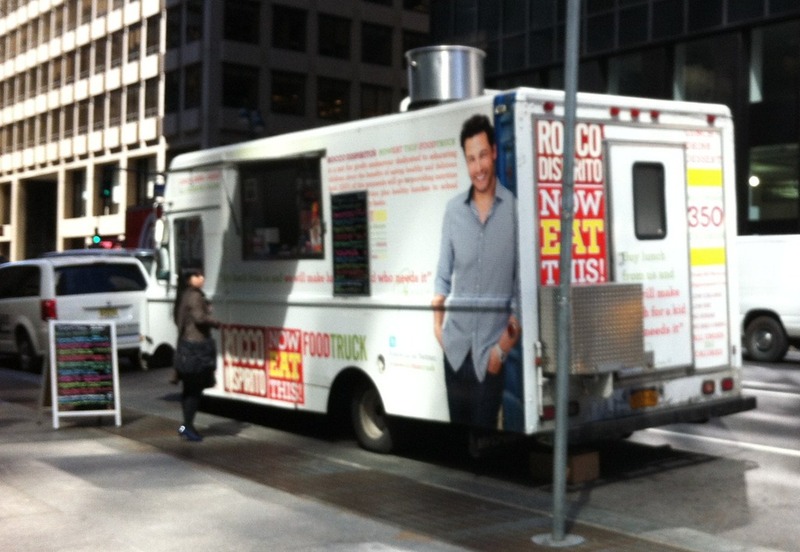 Although this sounds like a blatant promotion for Rocco, I do appreciate the fact that 100% of the proceeds from the sales at the food truck go toward educating New York City schoolchildren about how to cook and what is healthy to eat. WHERE TO FIND IT? If you’re in NYC, then the best way to find it is via facebook or twitter as the truck moves around from day to day. I found it today at 52nd and Lex. They are also now on Seamless, although I’m not positive what delivery radius they have. Watch Gordon Ramsay make PERFECT scrambled eggs! I was able to recreate it myself (see photos below). Ok, so you’re wondering what I could possibly say about scrambled eggs that you don’t already know! And two days ago, you would have been correct to wonder! But now that I’ve seen this video, I absolutely must share with you Gordon Ramsay’s PERFECT scrambled eggs. 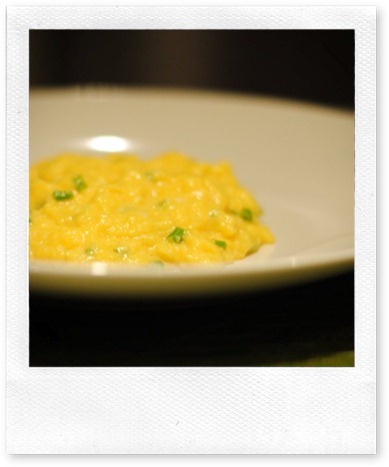 If you think you already know how to make perfect scrambled eggs….think again! Apparently (according to Gordon Ramsay), even many of the most experienced chefs don’t know how to make good scrambled eggs! 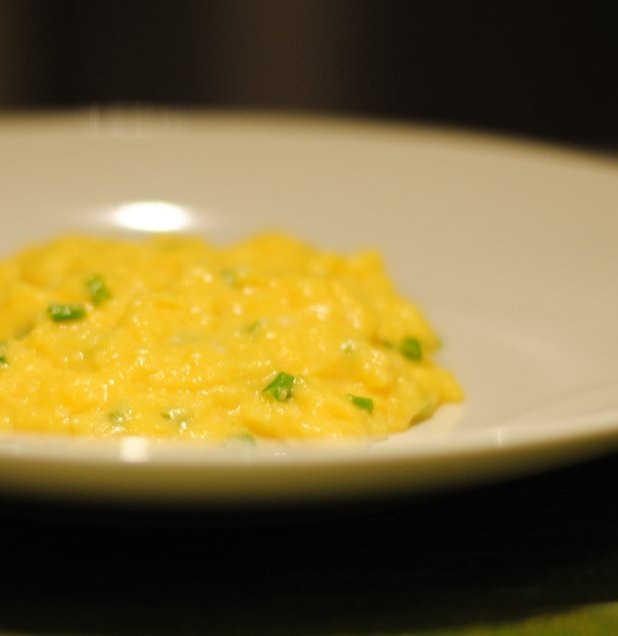 This is definitely not your typical scrambled eggs. 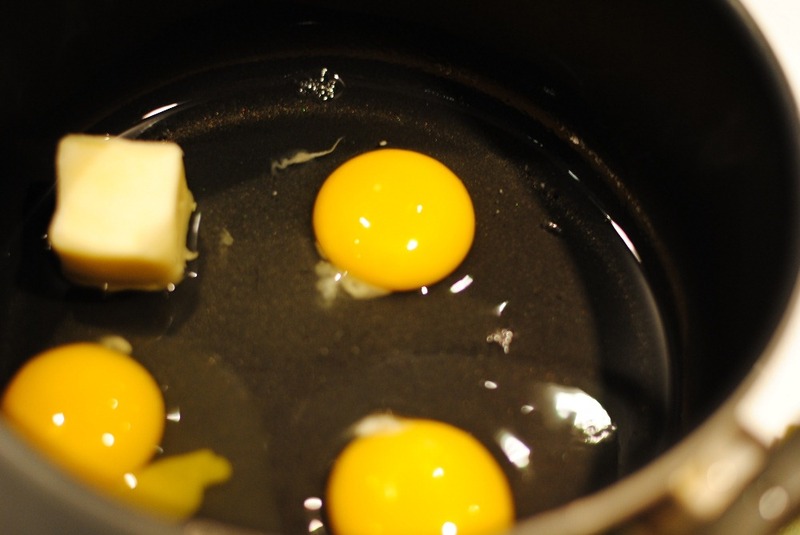 As you’ve probably heard before, the key is don’t overcook the eggs. But, this isn’t all that he does – with a few simple techniques, such as not whisking the eggs and not melting the butter prior to heating them, he creates scrambled eggs that are much creamier and much tastier. I’ve tried to summarize the technique below, but I recommend you also watch the video (although ignore the part about bread if you’re on a low carb diet). Who is Gordon Ramsay? For those of you unfamiliar with Gordon Ramsay, he is a fairly famous chef from Britain (there’s some good food in Britain, I promise!). He’s most famous in the US for the TV show, Hell’s Kitchen, in which he shouts and swears a lot (a lot!) in reaction to the mistakes made by aspiring chefs at the Hell’s Kitchen restaurant! I personally prefer the British TV show, Ramsay’s Kitchen Nightmares, where he visits various struggling restaurants and attempts to turn them around with varying degrees of success. 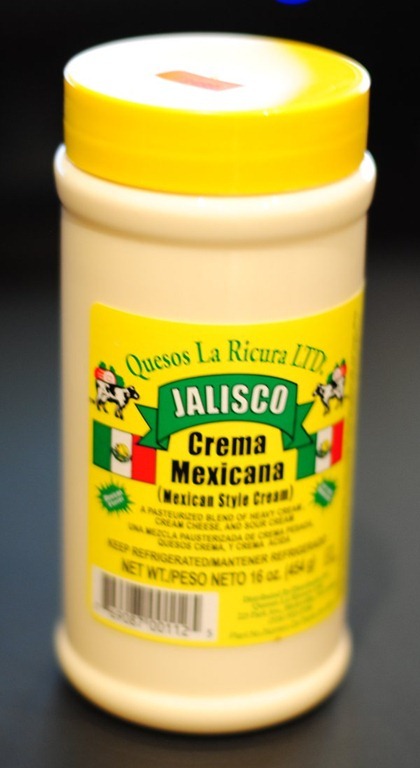 1/2 tablespoon crème fraiche (or Crema Mexicana if you can’t find crème fraiche). I think the recipe also works without this ingredient, but it’s better with it. 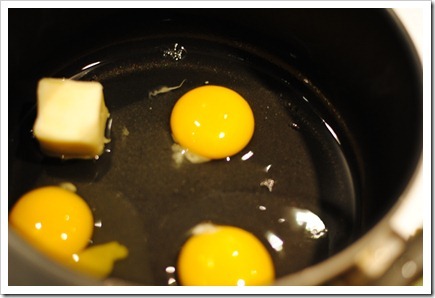 Crack the eggs into a pot and and add the chunk of butter to the pot. Put the pot onto medium heat and start stirring so that the eggs get broken up. Keep stirring without stopping. After around 2 minutes, the chunk of butter will have melted. Move the pot off the heat when you start to see some of the egg sticking a bit to the bottom of the pot. Keep stirring off the heat for about 10 seconds and then put it back on to the heat for another 20-30 seconds, but always keep stirring. Do this three or four times until you see that the mixture begins to become slightly more solid (but do not wait until it’s actually solid!). 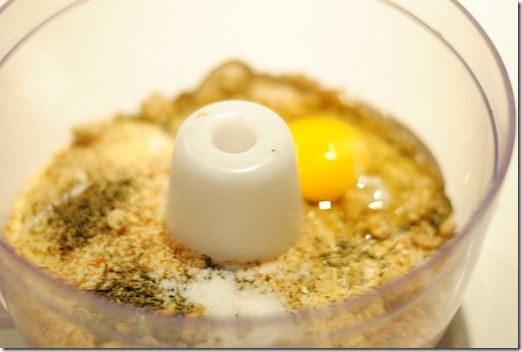 Once the eggs have just begun to solidify, take the pot off the heat permanently. 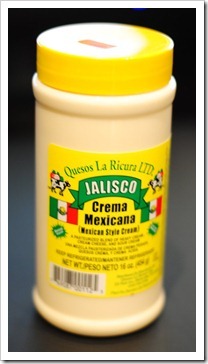 Quickly stir in the 1/2 tablespoon of crème fraiche (or Crema Mexicana) and the chives. Lastly, season with salt and pepper. How do the eggs taste? Delicious with a very creamy texture and taste. 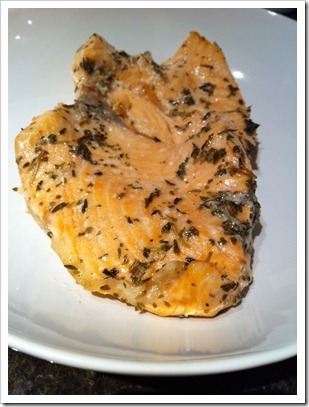 I also like how the chives add an extra dimension to the flavor. Can’t wait to try it with some smoked salmon like Gordon suggested in the video. Let me know how you like it! 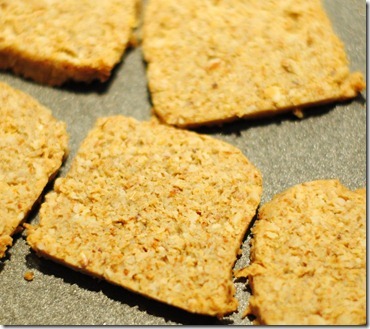 I saw a great recipe on Mark’s Daily Apple yesterday that I just had to try – crackers! You can dip them, spread cheese on them, or eat them by themselves. 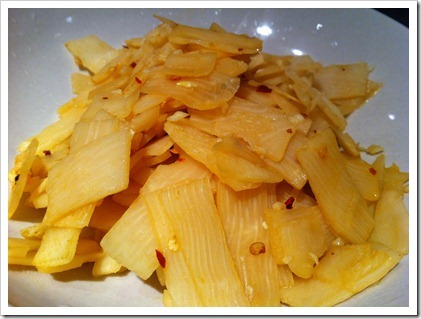 Of course, as Mark points out in his post, this is not something you should be eating for every meal just because it tastes so good, but it does make a great snack once in a while. I’ve modified the recipe a little so that it’s not so crumbly, which makes it a bit easier to cut and cook. I substituted part of the almond meal for flax meal. 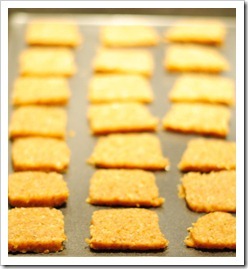 This also adds some extra fiber to the cracker without really changing the taste or the texture. I’ve described the basic recipe below along with one option for seasoning, but you can change the seasoning to any spices that tickle your fancy. 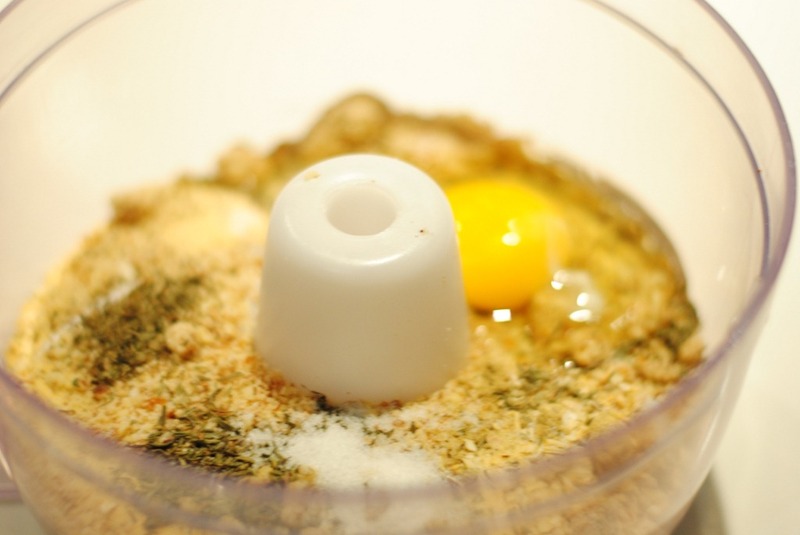 Place all the ingredients into the food processor and food process well to make a dough. 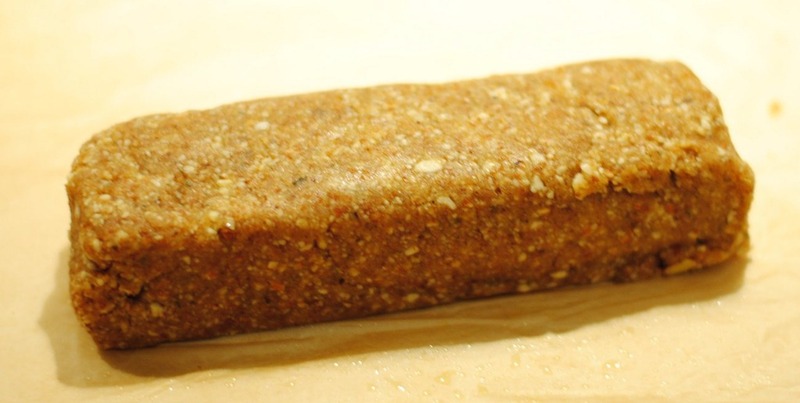 Shape dough into a log (as shown in the photo below) or roll into a flat sheet using tin foil or parchment paper. Place in fridge for 10 minutes to harden the dough. 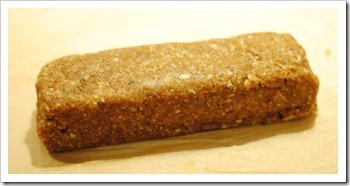 If you made it into a log, then cut into thin slices (1/3 of an inch). 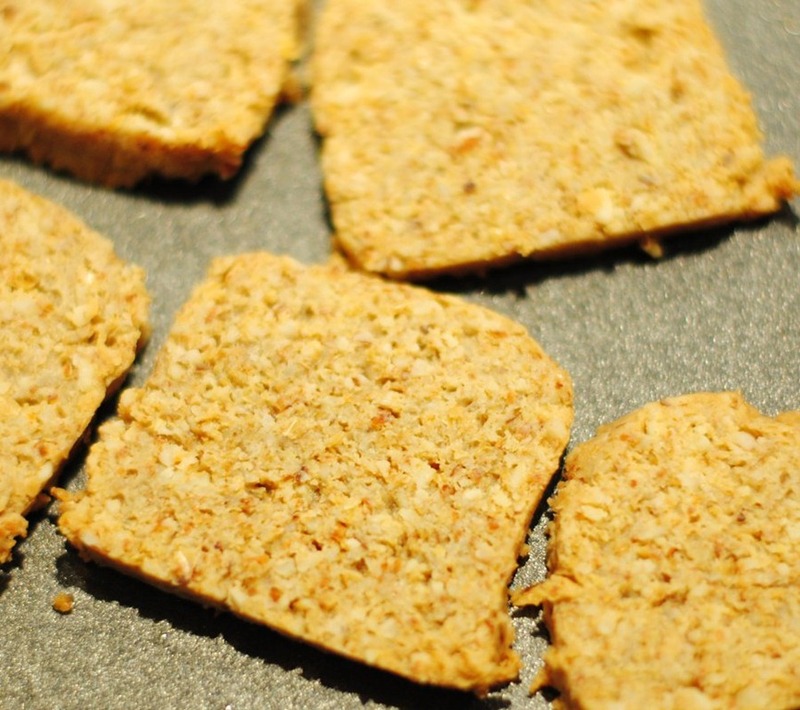 If you rolled it into and then cut into cracker shapes using a pizza cutter or knife). 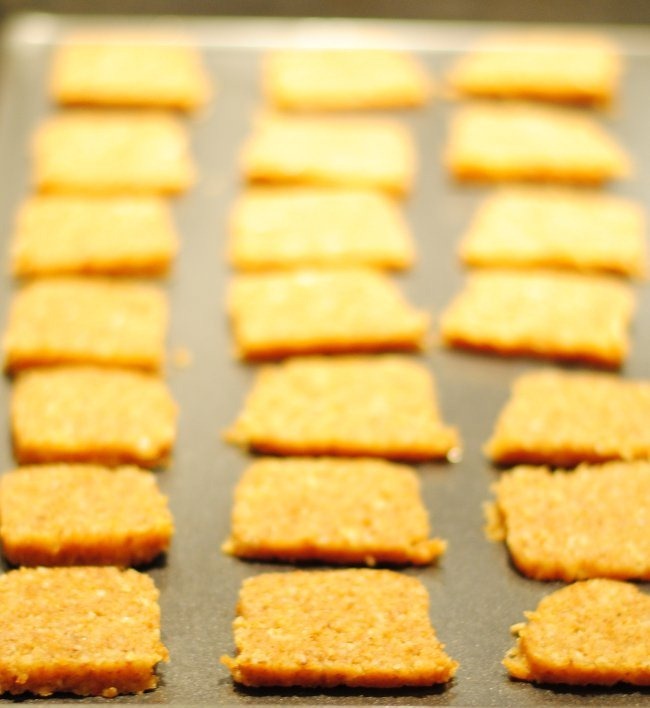 Place crackers onto baking tray and bake for 10-12 minutes. Let cool and store in the fridge over night (this hardens them even more). Nutritional information (per cracker): 76 calories, 6.7g fat, 2.6g carb (1.7g fiber), 2.7g protein. Baking Soda Vs. Baking Powder–Is There a Difference? If you’ve ever baked normal (full of carbs) cookies, cakes, or breads, then you have probably used baking soda or baking powder. You might also have come across cream of tartar perhaps. These are all common ingredients that you can find in the baking section of most grocery stores. For a long time, I thought baking soda and baking powder were the same thing and could be used interchangeably. I don’t really know why I thought such a thing – but it does explain why I wasn’t particularly good at baking before! What is Baking Powder? This is usually a combination of baking soda with an acidic agent (such as cream of tartar, which is described below) along with some other ingredients, such as cornstarch. Baking powder produces carbon dioxide bubbles, which expand in the oven (due to the heat) so that your baked goods will rise and become light and soft. 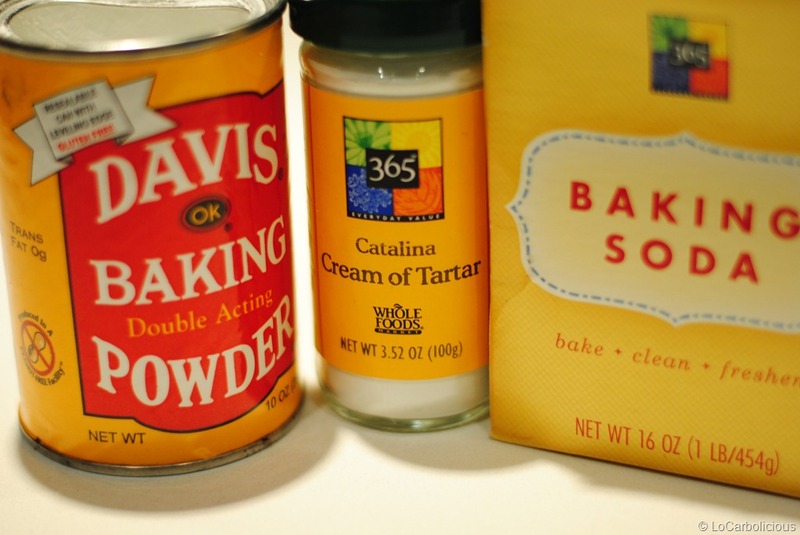 Baking powder can come in two versions: single-acting and double-acting. Single-acting means that as soon as you add the powder to anything wet, it’ll start giving off carbon dioxide bubbles, so you’ll need to put your mixture into the oven quickly to avoid running out of bubbles. Double-acting means that although some of the bubbles are released when you first add the powder to your mixture, most of the bubbles will come out when the mixture heats up in the oven. Therefore, you don’t have to worry about leaving your mixture out for too long when it comes to double-acting powder. Why is Baking Powder Problematic on a Low Carb Diet? Many low carb diets discourage cornstarch or any other type of starch, but this is unfortunately an ingredient in most brands of baking powder. The starch doesn’t actually add much to the cooking, but it does stop the baking powder from getting moist and clumping together. So, while the baking powder states that it contains less than 1g of carb, you should remember that its serving size is 1/8 of a teaspoon and most recipes call for at least a teaspoon or more (there are 2g of carbs per teaspoon of baking powder). If you’re not super strict on your low carb diet, then a teaspoon of baking powder is not going to be a problem. However, if you’re really counting every carb, then you can make your own starch-free low carb baking powder by using cream of tartar and baking soda combined. A simple recipe for making baking powder is below, but first let me briefly explain what baking soda and cream of tartar are. What is Baking Soda? It’s 100% sodium bicarbonate, which reacts with anything acidic in your baking mixture to produce carbon dioxide bubbles. These bubbles will start forming as soon as the baking soda touches the acidic ingredients, so you need to bake your mixture fast (otherwise, the bubbles will die out). What is cream of tartar? This is a white powder (potassium hydrogen tartrate) that is an acidic salt. It’s occurs naturally as one of the by-products of wine-making. It has many uses in foods, the most well-known of which is stabilizing beaten egg whites. Other uses include giving icing and meringue a creamy texture (hence its name I assume) and reducing discoloration of vegetables when boiled. For low carb dieters, it has another use. When added to baking soda, it makes a carb-less baking powder that works just as well as normal baking powder! There have been some health concerns about cream of tartar. First, it is high in potassium, which can be problematic for people with kidney disease or taking medications that prevent the kidney from getting rid of the potassium effectively. When taken in large amounts, cream of tartar can also be a laxative. However, the amount used in normal cooking is generally not a problem. 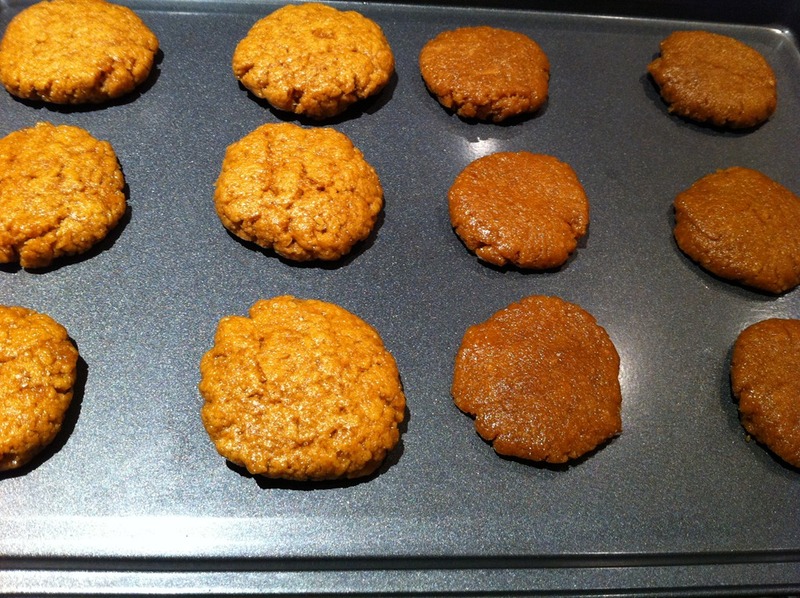 Low Carb Cookies – Peanut/Almond Butter Cookies that Don’t Crumble! 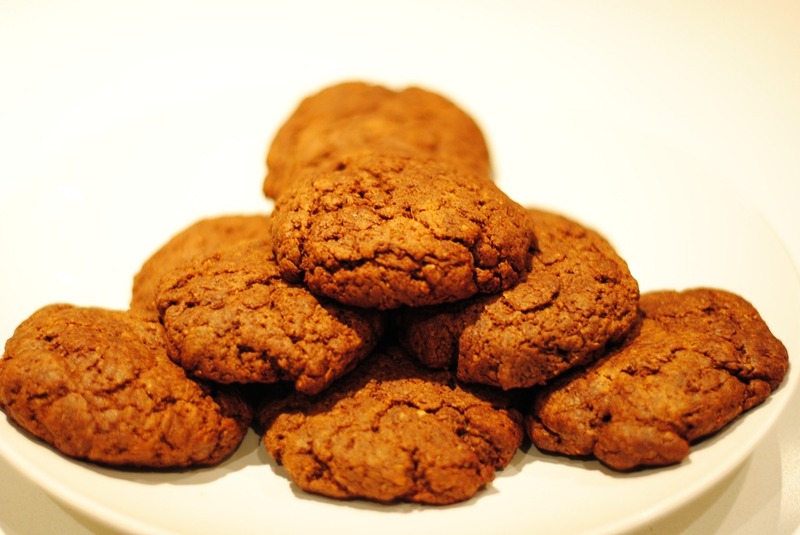 Yes, delicious low carb cookies do exist, and you are looking at a photo of them!! 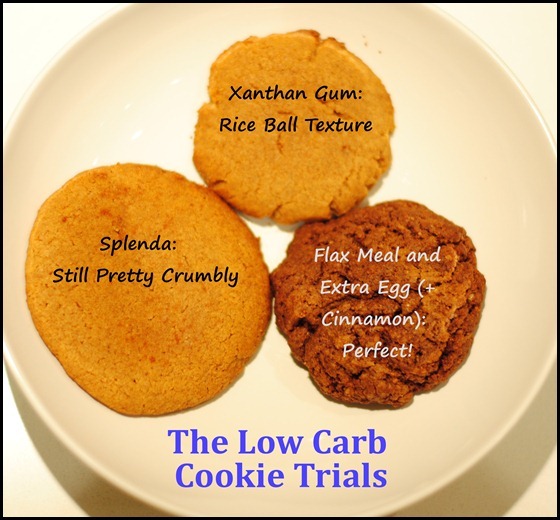 I tried making low carb cookies several months ago but gave up after finding them to be too crumbly. However, my interest was piqued again this past week when my cafeteria served flourless (gluten free) peanut butter cookies. They were a sell-out! But, making a flourless cookie was only half the battle – I still needed to get rid of the sugar in the cookies. I’ve described my trial and error process below, but you’ll love the ending (I did)…. 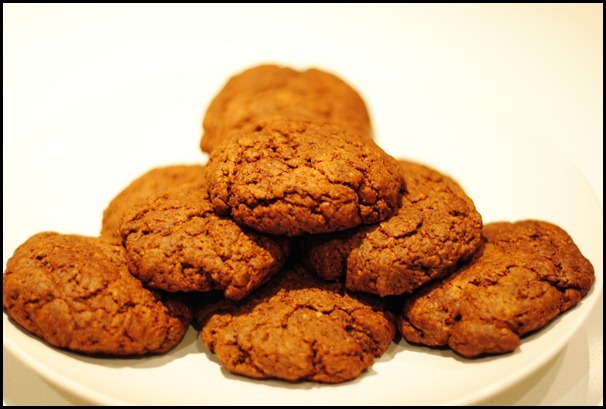 Crumbly Cookie: I looked up a simple flourless peanut butter cookie recipe, which was really simple: mix together 1 egg with 1 cup peanut butter and 1 cup sugar, and then bake for 10 minutes at 375F. I tried the simple substitution of liquid sucralose for sugar. The cookies came out delicious but incredibly crumbly – in fact, I could barely get the cookie to my mouth before it disintegrated into powder. The cookies were vanishing into dust, and I wasn’t even eating them! Substitute Splenda For Sugar: Next, I tried using Splenda. Although I’m not usually a big fan of Splenda (because of the bulking agents it adds), my cookies were in dire need of some sort of bulking agent! The cookies came out less crumbly, but were still very dry and all-too-eager to break into pieces. 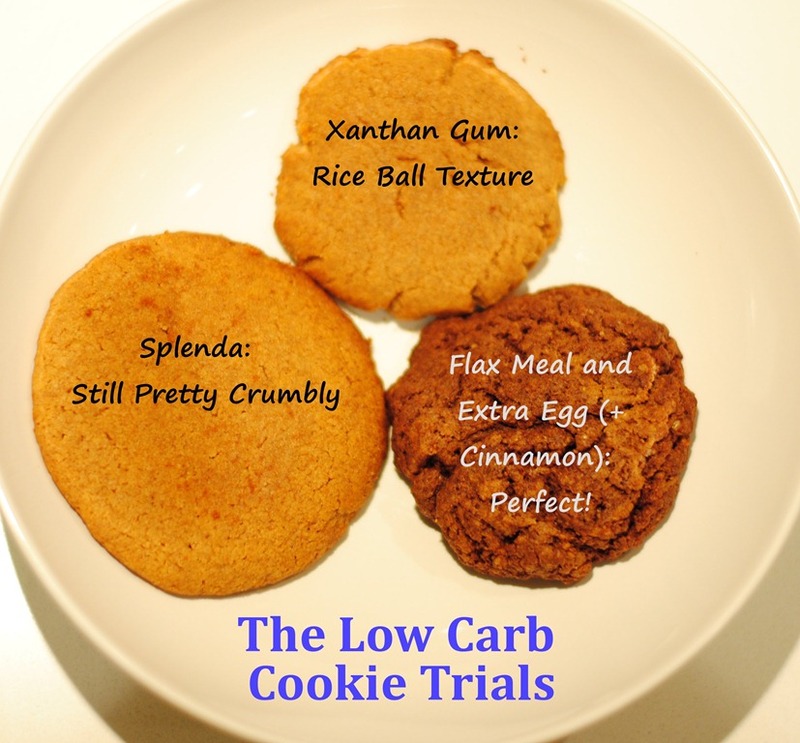 Xanthan Gum? I took some serious action after that by adding in some xanthan gum (which is a thickening agent that’s great in soups like egg drop soup). This made the cookies more coherent, but it also gave it a chewy texture – reminiscent of Japanese mochi or rice balls (both which are generally made from glutinous rice flour). Eureka: I soon (after quite a few more batches!) realized that perhaps eggs could act as the glue in this recipe. But I couldn’t just add more eggs in – it would make the recipe way too liquidy. I had to add something in with the eggs. That’s when it came to me…flax meal. The xanthan gum went out and the flax meal and extra eggs came into the mixture. 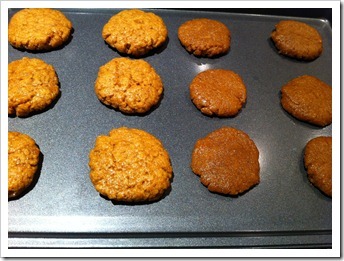 The cookies came out more solid, with a texture rather like oatmeal! Success at last. Mix the dry ingredients (Splenda, flax meal, baking soda, and cream of tartar together). Add the peanut/almond butter and the 2 eggs. Shape into 1 and 1/2-inch balls and flatten into cookies. Bake in oven for 8 minutes. Leave to cool (they’ll harden a bit more upon cooling). Note: the dough may look rather oily before you put it into the oven (and I think the cinnamon might draw some of the liquids out of the dough so that it looks like your dough is sitting in a puddle of water), but it comes out non-oily and moist on the inside! I grew up believing that broccoli was just the name for green cauliflower. I now know better, but it turns out that my childhood associations weren’t too far from the truth! Among the various types of cauliflower, there is actually a green variety that looks kind of like broccoli and even has a name similar to broccoli – broccoflower. You’re probably wondering why I’ve dedicated a whole post to a simple large ball-like vegetable. 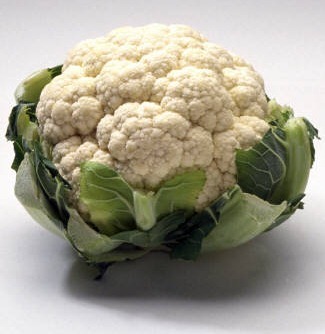 The fact is that vegetables are a key part of a low carb diet, and cauliflower is a useful vegetable to know about. When you puree boiled cauliflower, it forms a thick creamy texture that’s great as a thickening agent for soups and sauces. You can also use the puree by itself to make mashed cauliflower (if you add some butter) or cauliflower soup (if you add some chicken broth). In many cases, cauliflower can easily take the place of potatoes in recipes. Additionally, if you throw cauliflower into the food processor, then it forms small grain-like balls that are great for creating faux rice dishes (with a consistency much like couscous). Download the free recipe ebook for mashed cauliflower, cauliflower soup, faux rice, and other recipes. There’s so much that you can cook with just the white cauliflower. But now you can spice up your foods in a new way with all the colorful cauliflowers described below. Just think how cool purple mashed cauliflower will be! 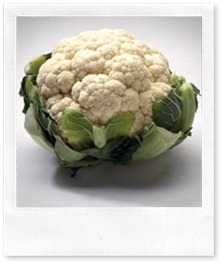 White: The most common cauliflower is, of course, the white cauliflower that we generally see in the supermarkets. It’s a very nutritious vegetable despite not being green! One cup of cauliflower contains over 75% of your daily recommended amount of vitamin C and over 15% of vitamin K, and studies have even suggested that substances in cauliflower may prevent cancer. Click here to read the news report. Purple: This rather uncommon cauliflower has such a great color that it’s easy to think it was dyed rather than naturally occurring. Its vibrant color comes from anthocyanin, which is an antioxidant that also causes red cabbages and red onions to be the colors that they are. 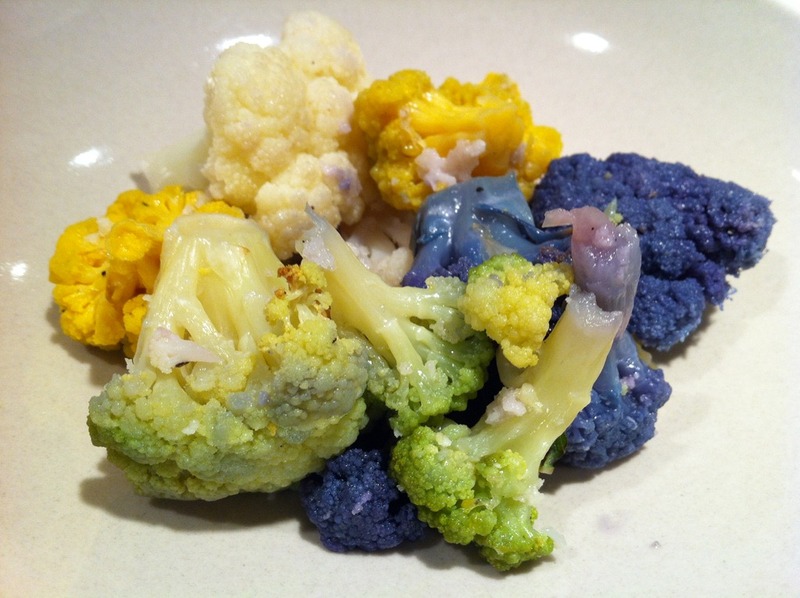 Some website state that purple cauliflowers are a type of broccoli and that they will turn green when cooked, which can be true (although I haven’t witnessed it yet). 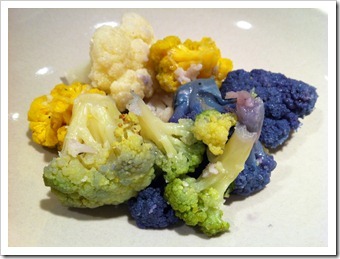 Many cauliflower varietals are intermixed with broccoli varietals, and so some purple varietals will turn green when cooked, but other varietals will not. The purple varietal I have pictured above definitely did not turn green when cooked! Orange: Yes, the colors get even more unusual. The orange cauliflower contains beta-carotene, which is an inactive form of vitamin A, and which is found in other vegetables such as carrots and sweet potatoes. This type of cauliflower was discovered in Canada back in the ‘70s and has since been crossbred with white cauliflowers to create the type that we see today. It has a slightly sweeter and creamier taste than the white variety. Green: And, finally, we get to broccoflower, which can either be a cauliflower/broccoli hybrid or a mutant type of cauliflower where the white florets produce chlorophyll, which is the same substance that makes other plants green. Vote for your favorite type of cauliflower below. I was recently surprised to find that some of my friends who are generally health-conscious had never heard of the Paleo diet. “It’s sometimes called the ‘caveman diet’?” I replied in a questioning tone. Still no signs of recognition. I spend a lot of time reading and writing about nutrition and diet, so it shouldn’t be surprising that my friends have not heard of certain diets with which I feel intimately acquainted. I guess my friend never read any of the articles entitled “Top 10 Craziest Diets!” (Several of which list and mock the Paleo diet, often alongside diets involving tapeworms – Yes, a tapeworm diet existed back in the 1920s – No, you should not try it)! With a nod to my friend, here is a simple explanation of the Paleo diet. The Paleo diet is based on the idea that it is, in many ways, healthy to live like our ancestors millions of years ago. The DNA that defines how our bodies function evolves very slowly over a very long time. For instance, humans have really only been eating grains for the past 10,000 or so years, which is too short of a time for our DNA to have evolved to digest those foods properly (likewise, humans have only been eating refined sugars and carbohydrates for an incredibly short time). The fact, then, that modern diets are often very high in grains and refined carbohydrates leads to a variety of health problems (e.g., there have been links to diabetes, allergies, digestion disorders, and Alzheimer’s). Although it’s often referred to as a diet, Paleo is really more of a lifestyle than a crash course for losing weight (even though weight loss often occurs when eating a Paleo diet). Therefore, it’s not just nutrition that is emphasized, but also exercise and reductions in daily stress. In general, the idea is that our food intake and weekly exercise regimes should more closely mimic that of our prehistoric ancestors. Below is a quick guide to what to eat and what to avoid as well as a description of the types of exercises done on Paleo. 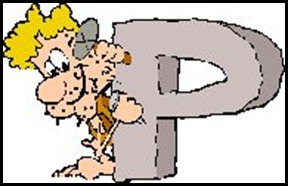 Ask yourself what a caveman would have eaten and you’re pretty much there! Click here for some sample meal plans. Vegetables are good and should be the bulk of what you eat every day. Meat should be consumed plentifully, although pasture-raised or grass-fed meats are encouraged. 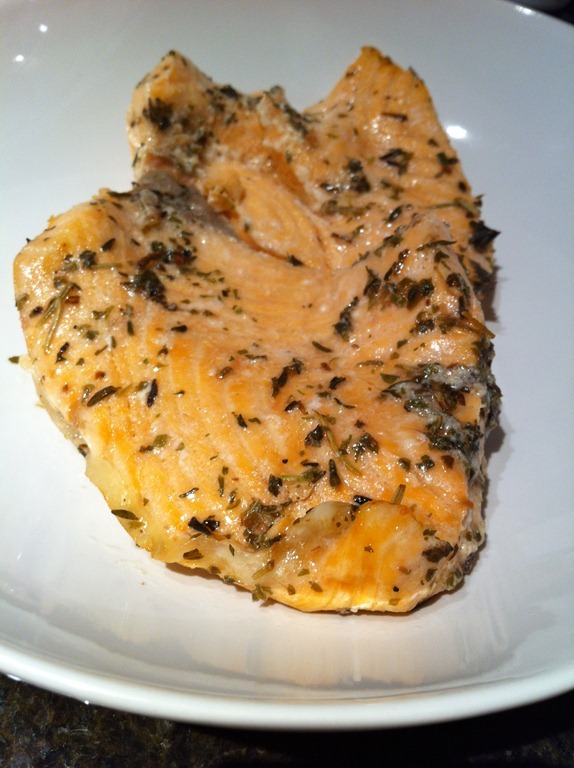 Good fats are highly emphasized in the diet. Good fats include animal fats (including both lard and butter), coconut oil, olive oil, macadamia oil, and avocado oil. 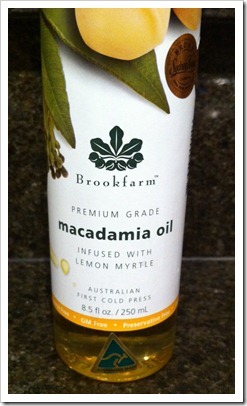 These oils are lower in certain fatty acids that most modern diets over-emphasize. Some starchy/sugary foods are permitted, although in moderation. For instance, sweet potatoes and yams are both OK to eat, but they should be eaten sparsely. Nuts and fruits are allowed, but again only in moderation. Cavemen obviously didn’t have orchards, but they might very occasionally come across some berries and nuts. No grains (including oatmeal, rice, whole grains, rye, corn, cous cous, and especially wheat). 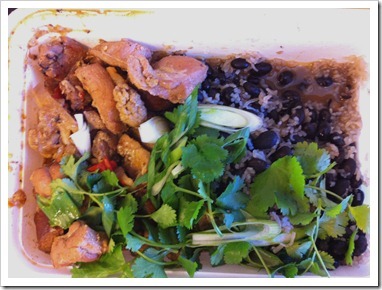 No legumes (including kidney beans, soy beans, black eyed peas, and pinto beans). No processed sugars (i.e. – no added sugar in any products you buy or cook). Generally, no dairy products (other than butter and heavy cream). There is great emphasis on exercise as cavemen did not sit around all day long. Neither did they jog ten miles a day on hard concrete, though. In addition to actual exercise regimes, Paleo lifestyles tend to encourage just moving around as much as possible (e.g. – walking or biking places and generally not sitting as much as possible). Cavemen also had to engage in really intense exercise every couple days, since they had to run from predators and/or chase down and kill animals to eat. Recently, an exercise regime referred to as “Crossfit” has gained a lot of popularity among those living a Paleo lifestyle. Many crossfit gyms have sprung up in recent years to offer these regimes. The regimes often include sprinting and weight lifting in short sessions lasting maybe just 20 minutes twice a week! The workout sessions are very short but also very intense. Click here for a video of crossfit exercises. The legal standard for false advertising seems to be very low. It seems that you can give completely misleading impressions about a product without facing any liability. Gone are the days when consumers can just pick up what they want from the supermarket shelf without worrying about studying the ingredients list (or maybe those days never existed). Now, we all have to be savvy consumers, especially if you are health conscious! Artificial sweeteners have received a hoard of controversy over the years. Unsubstantiated scandals of cancer and side-effects of headaches and nausea have plagued their existence. However, Stevia, which is a zero-calorie, super sweet compound derived from plants, has gotten a lot of press in recent years for being “natural” and “safe.” It’s difficult to say exactly how “safe” anything is, but people seem to equate “natural” as being the same thing as “safe” (I’m not sure how great this illogical reasoning is, but that’s another matter). Stevia has gotten so popular that several soft drink manufacturers have produced supposedly Stevia-sweetened sodas, such as Blue Sky Free and Zevia. However, if you drink these drinks or use Truvia (a popular brand of sweetener that contains Stevia), then you may have been duped….most of those drinks and sweeteners contain much higher quantities of sugar alcohol than Stevia! Truvia is one of the more popular brands of Stevia sweetener, but if you look at its ingredients, you’ll notice that the main ingredient is actually not Stevia at all, but erythritol. Erythritol is a sugar alcohol like sorbitol and xylitol, although it is “natural” like Stevia (in that it can be derived from plants). This is what gives each packet of Truvia 3 grams of carbohydrates and probably around 0.6 calories even though it’s labeled as zero-calories (as each gram of erythritol is 0.2 calories). Blue Sky Free is a soft drink made by Hansen (the company that makes “natural sodas”). 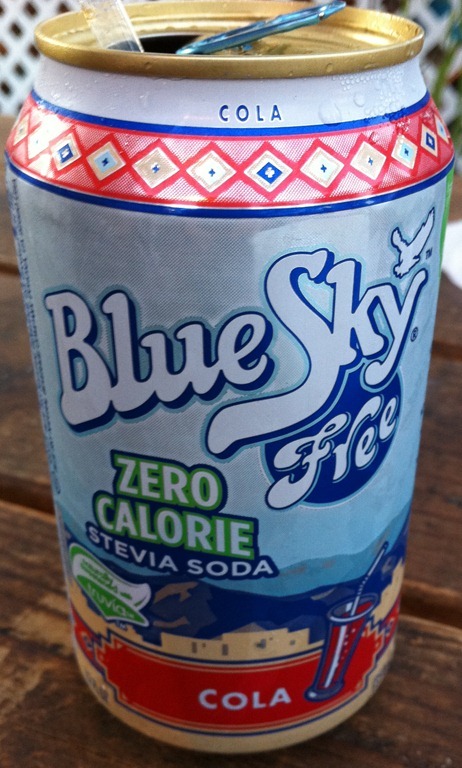 I tried a can of Blue Sky Free (the cola flavor) when I was in Oregon, and I have to admit that it tasted OK (a bit flat, but not bad). So what’s the problem? 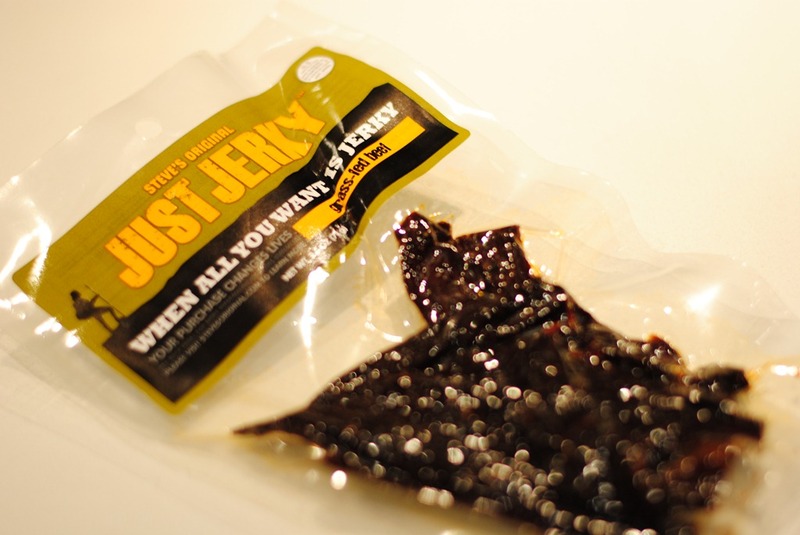 Unfortunately, it is flavored with Truvia, so it also contains sugar alcohol rather than just pure Stevia as a sweetener. If you don’t care so much, you can buy it either online at Amazon or at one of the stores listed on their website. A pack of 24 cans costs $24 (or $20.40 with Subscribe and Save) on Amazon. 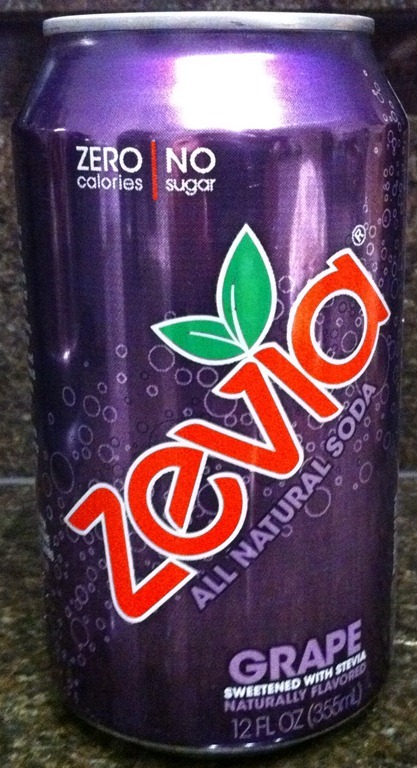 Zevia is another soft drink that’s supposed to be sweetened with Stevia (hence the name that rhymes with Stevia). Like Blue Sky Free, Zevia comes in a variety of flavors (although Zevia has more flavors), but I found the grape soda to taste pretty good. Unlike Blue Sky Free, Zevia is not flavored with Truvia. INSTEAD, they add erythritol along with Stevia extract. In fact, erythritol is the second most populous ingredient except for carbonated water! So basically, Zevia is just as bad as Blue Sky Free, except that some Zevia flavors contain caffeine. If you’re considering trying Zevia, then use their discount coupon and buy a 6-pack from Wholefoods, although they are also sold on Amazon. I personally think that sucralose is the best artificial sweetener out there both in terms of the slim chance of health problems and in terms of taste. But if you’re determined to use Stevia, then you ought to realize that very few things are currently flavored with just Stevia. SweetLeaf, which you can buy at Wholefoods or on Amazon, is a pure Stevia sweetener as opposed to Truvia. But it does taste more bitter, which is why Truvia, Blue Sky Free, and Zevia have chosen to put erythritol into the mix. It’s hard to know who to trust when it comes to information about artificial sweeteners, but you should try not to be fooled by all the claims of “naturalness” from the advertisers! “Natural” does not always equate with “health,” and advertisers have zero interest in your health!